Fluorescent compounds are used for a variety of applications from diagnostic medicine to solar energy production. The versatility of these molecules drives chemists to design brighter, faster, more stable fluorophores that are better suited for their various roles. However, the key to developing an improved fluorophore is not always based upon synthesizing a novel dye; instead, it can depend on changing the arrangement or configuration of existing dyes to enhance their photochemical properties. In this paper, the authors employed new methods to explore the properties of carbon dots (CDs), which are a fluorescent carbonaceous nanomaterial exhibiting high photoluminescence and biocompatibility. Despite their stellar fluorescent properties, CDs are often challenging to synthesize using traditional methods that give rise to a non-homogenous mixture of products with unknown chemical structures. 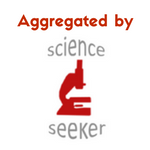 These variable production methods make it difficult to characterize specific CDs and limit the reproducibility of analytical testing with these molecules. In response to these technical difficulties, the researchers decided to use DNA-templated synthesis to generate DNA Carbon Assemblies (DNA-CAs). DNA-CAs are essentially uniform CD sequences used in a library-based screening approach. These methods allow for control over CD structure and provide detailed information about the photoluminescent properties of different CD combinations. The researchers generated hundreds of different DNA-CAs using a bead-based approach to anchor the sequences and allow step-by-step addition of the CAs using standard DNA synthesis techniques (Figure 1). The different DNA-CA combinations were then tested to find variants that responded to a single UV excitation wavelength (365 nm). Figure 1: Left: Random selection of bead-attached DNA-CAs from the library pool displaying a variety of emission wavelengths. Right: Schematic illustration of the DNA-CAs linked to a polystyrene bead. From this pool, top DNA-CA candidates were selected for exceptional photostability (>10 min at room temperature) and brightness. These molecules were also tested in HeLa cells to determine if they were cell-permeable and biocompatible for live-cell imaging (Figure 2). Figure 2: Top six DNA-CA candidates with their emission spectra and a snapshot of their staining patterns in HeLa cells. The top six DNA-CAs were determined to be highly cell-permeable and clearly visible in the cytosol of living cells. Interestingly, one of the dyes was able to penetrate the cell nucleus and exhibited a completely different emission wavelength in the nucleus versus cytosol. The researchers speculate that the dyes may change color in different environments due to changes in the DNA-CA charge states but this hypothesis still needs further experimental validation. 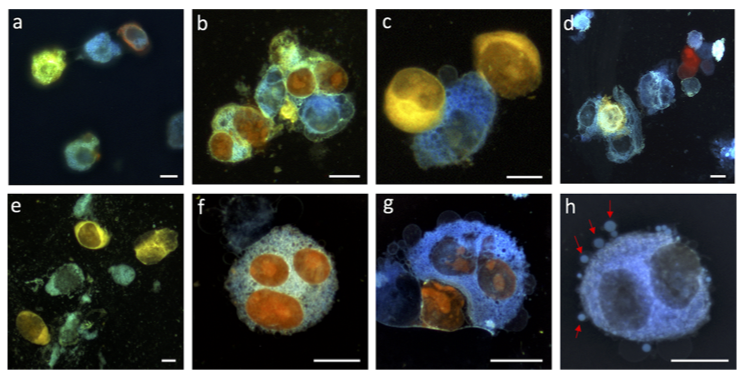 One of the dyes was also shown to be compatible for imaging vesicle migration, with another top candidate easily staining emerging vesicles during the experiment. 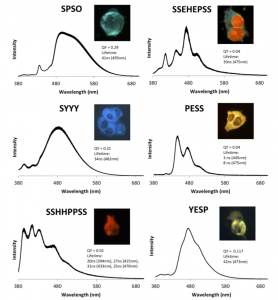 These results are extremely exciting, as they clearly display the power of a library-based approach for the design of new fluorescent compounds for biological imaging. The use of DNA-templated synthesis to reliably generate new carbon dot assemblies should yield a wide range of fluorophores with improved brightness and photostability suitable for use in cells. Although much work still needs to be done to optimize these dyes in vivo, this is certainly a promising first step illustrating the power of nanomaterials for imaging in a biological context!